Closest train station Lysaker, a hub served by both the airport train as well as regular NSB trains. Don't even think about taking taxi in Norway, unless you are rich. A taxi from the Oslo Gardermoen airport to Oslo city center takes 40 minutes and cost Norwegian kr (NOK) 1200 or more, i.e. 150 Euro, while the airport train takes 19 minutes and regular NSB trains talkes less than 30 minutes. It is 10 minutes walk from the venue. Edited 6 time(s). Last edit at 2014-05-25 09:17 by bv. So, you're saying the Europe tour will be on then? The easiest way to get to the arena from Oslo city center, is shuttle buses from the National Theatre (Nasjonalteateret) and Kirkeristen (close to the Central Station). It takes about 20 minutes and costs 100 NOK (12 euro) for a roundtrip ticket to/from the arena. I was not going to go Europe this summer. But start thinking only about Oslo show. Not an easy schedule for me, but maybe possible. Question to the locals.... I´m checking flights and it´s really cheap from Malaga. Moss Rygge is one of Oslo's airports, some 60 km south east of Oslo. There's an express bus from to airport to town. Gardermoen is the bigger airport, some 40 km from the city, lots of buses and trains going to town. Thanks a lot mate, really if I get a ticket I´ll go to Oslo so I´ll ask some more things in the next weeks I hope. How about Sandefjord Torp? On the map it seems like a long way, is there a decent and cheap wy to travel to Oslo? Oslo show confirmed! And Roskilde! Edited 1 time(s). Last edit at 2014-03-24 10:39 by Erik_Snow. Anyone know if there will be a presale for Oslo ? Someone who knows what is indicated by "Golden Circle"? Will there be a presale or something???? Edited 1 time(s). Last edit at 2014-03-24 12:23 by Lien. That was instructive! Thank you very much, Lien! Golden Circle means the "pit" (Front of Stage) area. Erik_Snow: I went to see Bruce Springsteen for two nights at Telenor Arena (was right in front for both shows after days of lining up - no separate pit tickets) and I didn't think the sound was THAT bad. Having said that and looking at the ticket/hotel/flight prices + the fact that I have a job commitment the following morning in Helsinki, it seems that Oslo falls out of my plans. Unfortunately. I love Norway, jeg elsker Norge! Edited 2 time(s). Last edit at 2014-03-24 12:49 by Topi. ok, so when is the presale? Any hostels/hotels worth mentioning in Oslo? I assume that always implies standing? Wife is pregnant, so we better grab some seats. Thanks, I¨ve just book in the thon hotel astoria. Been so close to Central Station is perfect for go - back from both airports and take the bus to the Telenor arena, right??? Yes, Bus #31 in front of the central station takes you straight to the arena. Heavy traffic between 15:00-17:00. Train to Lysaker and a walk might be better. The main airport, it is approx 40 km north of Oslo, and as Fornebu and Telenor Arena is south west of Oslo, it will be around 50 km to OSL, but still OSL is the recommended airport. They call it Oslo but it is 2 hours south west of Oslo. Ryanair and Wizz air use it, among others, mostly budget airliners, take the bus and you are in Oslo, but it takes time. This one is south east of Oslo, mostly used by the airliner "Norwegian" (http://www.Norwegian.no) . 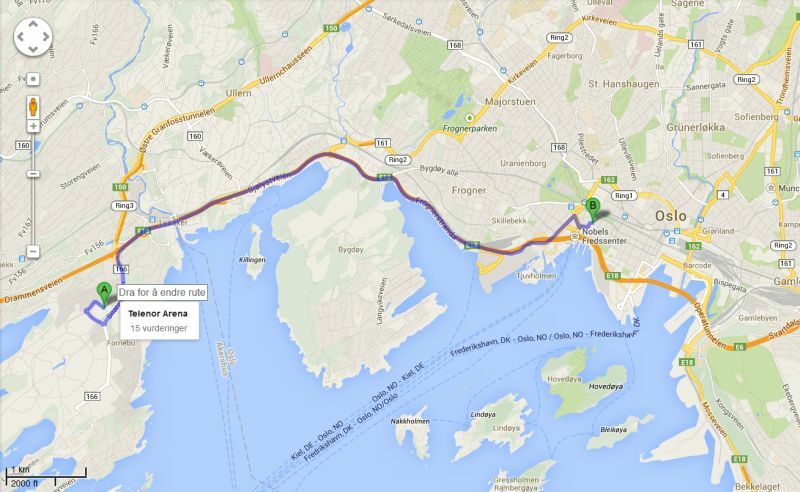 It is near the city of Moss, around 70 km, 1++ hours, and a bit more to Telenor Arena. Remember Torp and Rygge are in the middle of nowhere. If the flight here is cancelled you are stuck, it might take hours to get around, while at OSL you will be able to choose between many other airliners, it is the main hub in Norway, one of the most important airports in Scandinavia. If you are busy, use OLS, if you have plenty of time, use the chapest one. This is the stage setup for the Rolling Stones in Oslo Telenor Arena show. 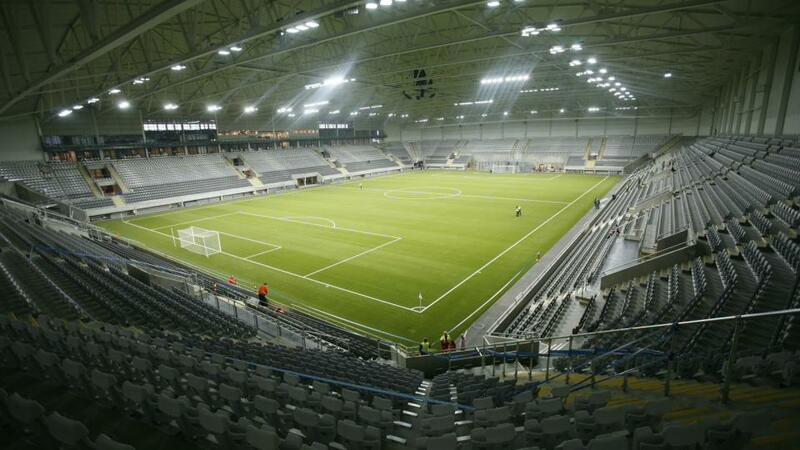 The whole floor is fotball field size, standing, open admission, with golden circle standing in the front. Edited 2 time(s). Last edit at 2014-03-24 15:01 by bv. BV, do you mean that the floor is a lot bigger than usual arena floor (basketball)? Yes. It is NOT an ice hockey or basketball arena. I have scaled down the picture now. The floor is the size of an European football pitch i.e. soccer game size. It is like Amsterdam arena... Wide and deep. The best seats will be D, E, O, N. The closest standing area will be on the field in the front, and of course the Golden Circle will be up front standing very close, like the toungue pit but slightly bigger area. The arena has been there may be 6-8 years now, right next door to my home, more or less, but I have never been there, because I have always been busy with the Stones, or I like shows in Sentrum Scene and Oslo Spektrum and Union Scene better, and Konserthuset, and transportation in and out of Fornebu I just hate it, a bottleneck, but this time I have to go there. Edited 2 time(s). Last edit at 2014-03-24 15:50 by bv.